On the night of July 26, 2018, Redding residents ran out of their front doors to see a towering wall of flames reaching a black sky. It looked like it was right there, just down the street, barreling towards them. They hurriedly packed their children and their pets and important documents into their cars and swarmed onto the Interstate 5 freeway to get as far away as they could. But there was an added complication for people without the means to leave at a moment’s notice. What would you do if you didn’t have a car, or the physical ability to drive? What if you weren’t fluent in English? Would you know where to go, or how to get there, or what to do in the following days? 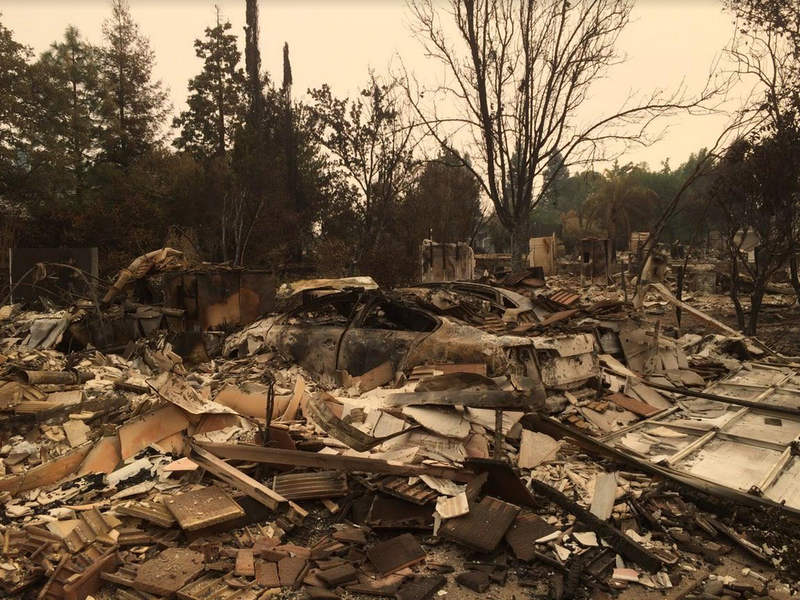 The Carr Fire destroyed 1,000 homes that week and took eight lives. The Mendocino Complex Fire followed shortly after, growing into the largest fire in the state’s history. But the fire season wasn’t over yet. The Camp Fire hit Paradise in November — the deadliest wildfire in the state’s history — destroying nearly 18,000 buildings and killing 85 people. Aside from the Bay Area, Northern California is largely a rural expanse of wildlands and isolated clusters of residential towns and small cities. The population is predominantly white. But there are pockets of communities that don’t fit the usual narrative of people who are impacted by wildfires, and they are the ones who suffer the most long-lasting impacts. A study by the University of Washington and the Nature Conservancy reported that over 29 million Americans live with significant potential for extreme wildfires, and most of them are white and socioeconomically secure. About 12 million of them are socially vulnerable, including minorities, people with disabilities, and people living in poverty. The study concluded that census tracts that were majority black, Hispanic or Native American experienced a 50 percent greater vulnerability to wildfire than others. The fact that wildfires leave the most lasting impacts on vulnerable populations might seem obvious. It’s only logical that people who have less money or fewer social privileges can’t recoup the damages as easily. But most people aren’t aware of the extent and nature of those damages, and many aren’t aware of how wildfire disasters disproportionately affect people of color. About 86 percent of people in Siskiyou County are white, 12 percent are Latino or Hispanic, 5 percent are Native American, and 1 percent are black. The median income is $40,000 and about 18 percent of people are living in poverty. Most other rural Northern California counties have similar numbers, although about a quarter of Mendocino County is Latino or Hispanic. Because of their small numbers, it’s easy to overlook minority populations in rural areas. But their stories count and they speak multitudes of a system that wasn’t built with them in mind. In the next year, Jefferson Public Radio will highlight the stories of Northern Californians impacted by recent wildfires to show how local emergency, recovery and prevention services could better account for people with diverse needs and backgrounds. Under the auspices of the 2019 California Fellowship, we will produce a multi-part radio and web series highlighting individual stories of vulnerable populations. This series will consider how housing affects people’s safety when they are evacuating, the physical health impacts that people who work outdoors endure during smoky days, and how cultural differences might affect people who are responding to evacuation notices or seeking recovery assistance following a wildfire. We will also research ways to improve our wildfire preparedness and response systems with a social-ecological perspective. In the end, approaching wildfire adaptation in this way — with a holistic perspective that considers people’s diverse cultures and backgrounds — is the first step in creating more safe and resilient communities across California.